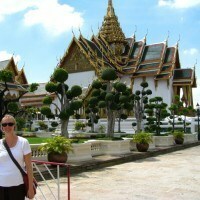 That’s me at the Grand Palace in Bangkok, Thailand. My husband and I traveled to Asia a couple years ago. Aside from seeing spectacular Buddhist temples, enduring incredible heat, and riding on elephants (it’s bumpy), we ate A LOT in Thailand. It’s not only that food is cheap in Thailand. It’s that the food tastes as spectacular as those sparkly temples look. While in Thailand my enjoyment of chicken curry (and Singha beer) went to a whole new level. Aside from the fantastic flavors, I loved that the meat stayed on the bone and that almost every dish included these tiny little eggplant that I’ve only seen in Thailand. I thought they were peas at first! I think I ate chicken curry every day for three weeks. 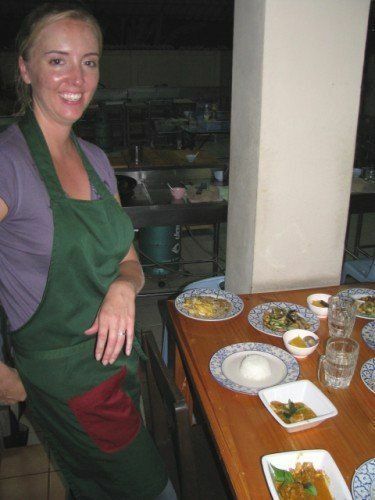 We even took a cooking class and learned to make chicken curry the Thai way. That’s me, in the class, sweating my tush off. Since returning to the U.S. I’ve had some pretty awesome chicken curry, but I think it tastes better in Thailand…just cuz. That doesn’t stop me from making my own chicken curry, including a version of the coconut curry sauce recipe I found over on PickyEater.com. She served the sauce with vegetarian dosas, but I modified the recipe a bit and baked chicken in it. Instructions: Heat olive oil in sauce pan and cook onions and garlic in pan until soft. Stir in all seasonings and vegetable broth. Then, slowly add coconut milk all the while stirring. Throw in tomatoes last and let the sauce simmer for 10 minutes or so to let flavors come together. 1. While the sauce is simmering, preheat the oven to 425 F and pound away at four chicken breasts with a meat tenderizer or a frying pan (I prefer the frying pan). 2. Once the breasts are nice and smooth, season them with salt and pepper and then place each breast in its own foil square. 3. Add veggies if you like. I put a few brocolli, cauliflower, and green pepper pieces in the foil bundle. 4. 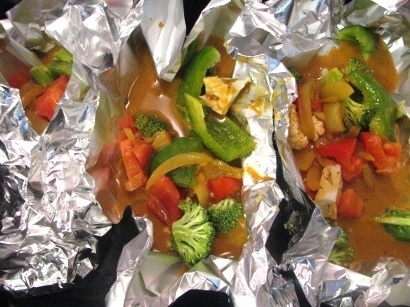 Last, pour a ladle full of the sauce into the foil and then fold the foil so as to cover the chicken and vegetables entirely. Bake the chicken and veggies for 20-25 minutes. Before serving, garnish with lime. Not quite like Thailand, but I’ll still eat it! Sounds like you had an incredible trip. I’ve never been there but hope to go sometime especially if they have cheap good food. I’m definitely a fan of curry. This recipe sounds delish! My nephew spent a year in Thailand and he loved the food and said it was hot, hot, hot. . . the weather that is. I love curry myself and will be trying your recipe. You might be able to find those little eggplant at H-Mart. It seems like they had some really tiny ones when I was there last. @ La Phemme Phoodie – Right. You definitely don’t have to look far in Thailand for cheap (and good) food). @ Karen – Great tip about H-Mart. Will definitely be making my way over there. 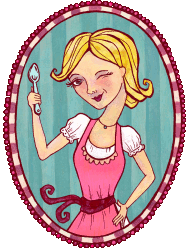 I love coconut curry sauce – I like your idea of baking chicken with this sauce!